Summary and Definition: The Wall Street stock market crashed in October 1929. The 1929 Wall Street Crash was fueled by the prosperity and massive economic boom enjoyed in the Roaring Twenties. The economic boom in the 1920s led to high consumerism, easy credit schemes and increased debt. The prolonged period of of rising stock prices was called the Long Bull Market during which time stock brokers encouraged speculation with the practice of buying stocks "on margin" (buying stocks with loaned money). The economy began to contract and professional investors started selling their stocks and share prices began to slowly fall. Stockbrokers began to make large-scale margin calls, demanding that investors repaid their loans all at once. Panic started, smaller investors, worried about paying off their loans, began to sell and stock prices fell even further. The stock market went into free fall and on Tuesday, October 29, 1929 (nicknamed Black Tuesday) stock prices completely collapsed. Between $10-$15 billion was lost in just one day due to the plummeting share prices and the 1929 Wall Street Crash. 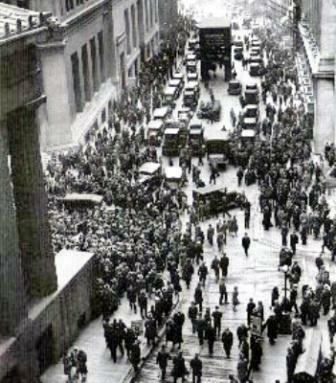 Wall Street during the 1929 crash. Who was the President in the 1929 Wall Street Crash? 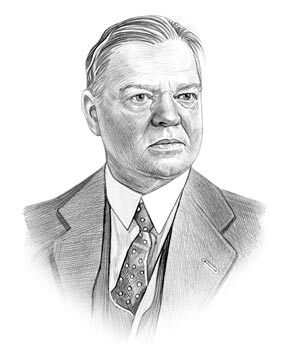 Herbert Hoover was the 31st US President who served in office from March 4, 1929 to March 4, 1933. One of the most important events during his presidency was the 1929 Wall Street Crash on October 29, 1929 which contributed to the period in US history known as the Great Depression. Fast, fun facts and Frequently Asked Questions (FAQ's) about the 1929 Wall Street Crash. What was the 1929 Wall Street Crash? The Wall Street Crash was the collapse of U.S. Stock Market due to the panic-selling of massive amounts of stocks and shares. Between $10-$15 billion was lost in the Wall Street Crash in just one day. What caused the Wall Street Crash? The Wall Street Crash was caused by a variety of different factors including the US Economic Boom, over-confidence, consumerism, overproduction, easy credit, the Stock Market boom and the 'Long Bull Market'. The following fact sheet contains interesting facts and information on the story of what happened in the 1929 Wall Street Crash for kids. 1929 Wall Street Crash Fact 1: America was enjoying an economic boom, a period of growth and prosperity. Industries and businesses boomed and people began investing in the stock market attracted by the potential of massive profits. 1929 Wall Street Crash Fact 2: Wall Street had prospered from the 'Long Bull Market' in which stock prices rocketed from an average of $50 per share in 1922 climbing to an enormous $350 per share in 1929. 1929 Wall Street Crash Fact 3: The Long Bull Market saw more investors wishing to buy stocks than were willing to sell, which led to the continuing rise in share prices as investors competed to obtain available equity. New investors, eager to get a share in the market, bid the prices of stock up. 1929 Wall Street Crash Fact 4: Stock prices had began to rise sharply in 1926 and 1927, but the high point for the 1929 market prices was August 1929. 1929 Wall Street Crash Fact 5: American were 'Buying on Margin' to acquire their stocks - which effectively meant buying stocks with loaned money. 1929 Wall Street Crash Fact 6: By 1929 between 3 to 4 million Americans (about 10% of US households) had invested in the stock market. 1929 Wall Street Crash Fact 7: On March 25, 1929 there was a mini-crash on Wall Street. Banker Charles Mitchell managed to stop the market’s slide on this occasion but the 'writing was on the wall'. Most ignored the warning. 1929 Wall Street Crash Fact 8: During 1929 steel production was declining, construction was decreasing, automobile sales were down, and consumers were building up high debts because of easy credit. 1929 Wall Street Crash Fact 9: Despite the serious problems the stock market continued its upward momentum, heedless of real economic indicators, and stocks hit record levels month after month and the Dow Jones index had more than doubled since its low point in March 1929. 1929 Wall Street Crash Fact 10: The Bull Market could only last as long as investors were putting new money into it. By the summer of 1929 the Wall Street stock market was running out of new investors. The following fact sheet continues with facts about Facts about the Causes of the Wall Street Crash for kids. 1929 Wall Street Crash Fact 11: On 5th September, 1929 investor and business theorist Roger Babson made a speech at the Annual Business Conference in Massachusetts predicting that 'Sooner or later, a crash is coming, and it may be terrific'. 1929 Wall Street Crash Fact 12: By September 1929 professional investors realized that the economy was dramatically decreasing and were aware of the dangers of the 'Boom and Bust' cycle. They began to sell off their stocks. 1929 Wall Street Crash Fact 13: Share prices began to slowly fall and more investors, worried about their ability to pay off their loans, also started to sell. The downward spiral had begun and and stock prices fell further. 1929 Wall Street Crash Fact 14: On Monday, October 21, 1929 stock brokers began to make large-scale 'margin calls' demanding immediate repayment of loans from their clients. The Panic on Wall Street started to set in. 1929 Wall Street Crash Fact 15: The panic started to spread and within four days, on October 24, 1929 (Black Thursday), a record 12,894,650 shares were traded on the Wall Street Stock Market. 1929 Wall Street Crash Fact 16: On Friday October 25, 1929 Leading bankers and investors frantically attempted to stabilize the market by buying up blocks of stock that resulted in a moderate rally. 1929 Wall Street Crash Fact 17: On Monday, October 28, 1929 the stock market went into free fall and losses as high as $5 billion were reported. The contagion spread to the stock markets in Europe. 1929 Wall Street Crash Fact 18: On Tuesday, October 29, 1929 (Black Tuesday) stock prices completely collapsed. Margin buyers were forced to sell and there was panic-selling of all stocks. 1929 Wall Street Crash Fact 20: Share prices continued to drop and by mid-November a staggering $30 billion had been lost on the stock market. 1929 Wall Street Crash Fact 21: On November 23, 1929 the stock market hit rock bottom and then at last began to stabilize. The 1929 Wall Street was finally over. It took 23 years for the US market to recover. The article on the Wall Street Crash provides detailed facts and a summary of one of the important events during his presidential term in office. The following Herbert Hoover video will give you additional important facts and dates about the political events experienced by the 31st American President whose presidency spanned from March 4, 1929 to March 4, 1933.